Held in Cape Town, South Africa. Pictures: Day 1, Day 2, Day 3, Day 4. 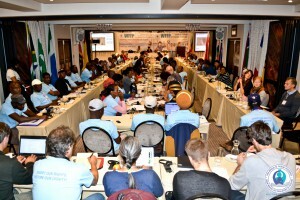 Interviews: The WFFP talks to a variety of it’s members from all around the world discussing the unique challenges that they face in their country. Welcoming Address: Mr Bongo, the Chairperson of Masifundise, welcomes the attendees of the 6th WFFP General Assembly. Opening Speech: Ms. Maria Hoffman, founding member of Coastal Links South Africa, and Board Member of Masifundise, delivered a speech on the devastating effects that the Individual Quota System in South Africa had on small-scale fishing communities. Tribute to Thomas Cocherry: Speech given by friend and colleague Andrew Johnston to the General Assembly. Closing Speech: Delivered by the South African Minister of Agriculture, Forestry and Fisheries Senzeni Zokwana. Minister Zokwana if also a Member of Parliament and President of the South African Communist Party. Presentation by Ms. Jackie Sunde of the ICSF. 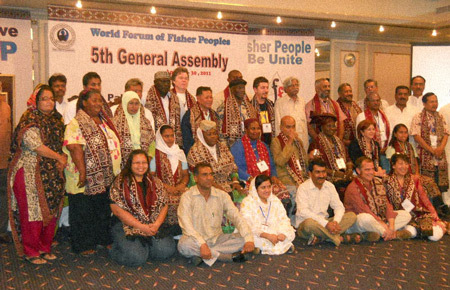 Jackie has previously co-authored papers on fishers rights with WFFP General Secretary Naseegh Jaffer and presented to the 6th GA the transformative agenda in the context of the SSF Guidelines. Keynote Speech delivered by Associate Professor Seth Macinko of the University of Rhode Island. His presentation warns the General Assembly of the hijacking of their language by the forces that look to privatise the world’s oceans. As PDF: On Youtube. Mads Barbesgaard, Chairperson of Danish solidarity organisation Afrika Kontakt presents the issues of the global ocean grab and the mechanics that drive this destructive process. As PDF: On Youtube. Nicole Franz from the FAOs Fisheries and Aquaculture Department talks about FAOs perspective of the implementation of the Small-Scale Fisheries Guidelines. As PDF: On Youtube. PLAAS Seminar at the WFFP GA: Presentation by Nicole Franz on the Global Significance of the Small-Scale Fisheries Guidelines. Presentation by Moenieba Isaacs on the the importance of the International Guidelines on small-­scale fisheries in ensuring food security. Held in Negombo, Sri Lanka.